In today’s blog post I wanted to highlight my favorite product that I use twice a day. No it’s not a serum or a lotion, but even more important than that.. it’s an electronic toothbrush! 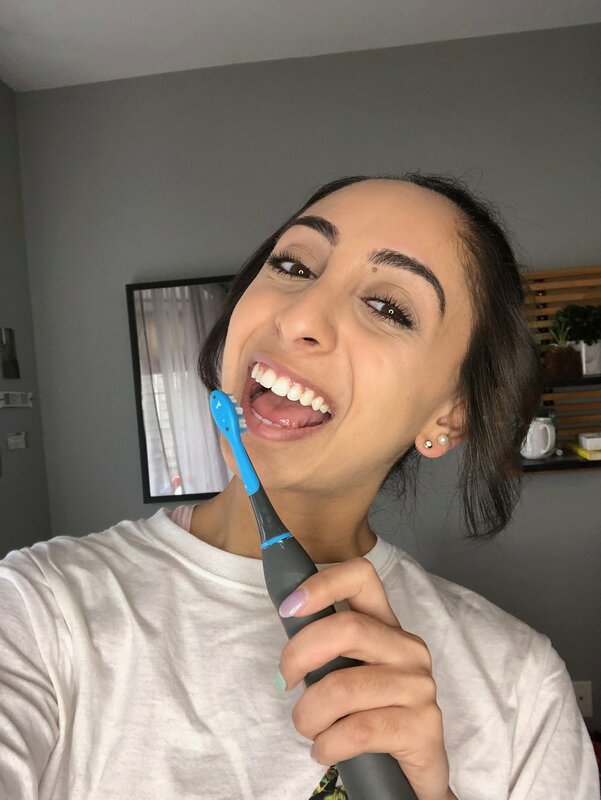 I’ve partnered with Smile Brilliant to showcase their new electronic tooth brush that I’ve been using for over a month now. This has been a really easy addition into my daily routine and has helped keep my pearly whites healthier and whiter! I’ll say it once and I’ll say it again, a smile is the best accessory, so having this tooth brush has been a huge asset! The features on the cariPRO ultrasonic electric toothbrush are extremely well thought out and make life so easy! The tooth brush comes with a base, 2 heads, and a charger. The base has 5 different settings (clean, white, massage, gum care, sensitive) that you can switch in between, and pauses every 30 seconds so that you can time your two minutes perfectly and hit every quadrant in your mouth. In the little over the month that I’ve been using this brush, I haven’t had to charge it once which I think is a major plus that I don’t have to think about. Additionally, I have been using the “white” setting which has also made a big difference for me because we all know I’m an avid coffee drinker. Having this setting makes me feel way better during my busier times when I can’t spend the hour doing whitening strips or other remedies. Overall, having this has been such an easy addition that not only makes my teeth healthier, but whiter and more clean! A smile makes the biggest difference, so anything that makes me feel more confident in this part of myself is huge for me. And with that, I hope you got some inspiration to focus on the happiest part of yourself!